When moving the mouse while the first cutscene ends, the view angle can change. There is even a chance you won't be able to select Caesar anymore. The tutorial at the very beginning, where I have to select Caesar: deselecting him causes a glitch sound. The "you've deselected Caesar" voice triggers when I select him again. Diplomacy allows me to set the Suebi & Salassi as allies. Funnily enough I then get the message that hostility increased by 11. I was also able to set a truce with the Helvetii. I believe the battle of Bibracte should trigger earlier, somewhere halfway between the Arar bridge and Bibracte. 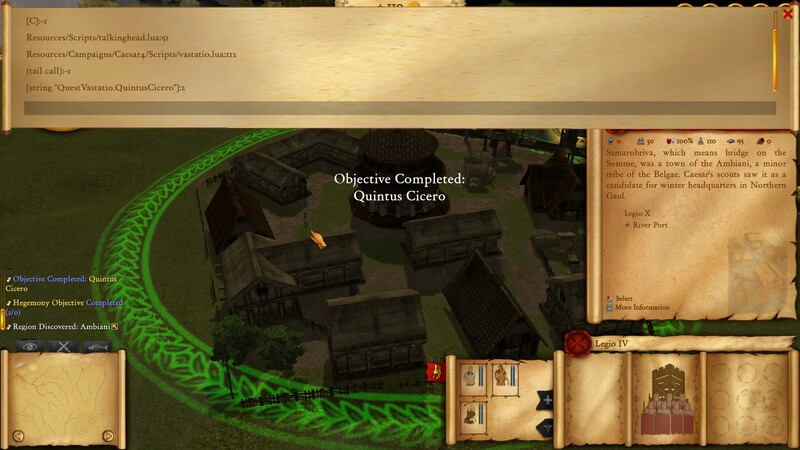 As it is now, a player can just move his units inside Bibracte and wait it out. Objective - Defeat the Helvetii ambushers (0/4): defeating the second unit set the progress to 3/4. Objective - Defeat the Boii & Tulingi: apparently there is still a chance for these units to stay out of bounds. It worked when I reloaded afterwards though. When I moved a legion to the very edge of the boundary (I was trying to use my pilums to defeat those idle units from the previous bug), that legion unit got stuck there and was no longer able to move anywhere. Other than that, just some pathfinding and AI issues that have already been pointed out previously. Right now it's still quite easy to exploit the AI. For starters, I´d really like to see AI units scavenge farms whenever they are about to run out of food. I was thinking. There's a lot of micro-management in capturing surrendered enemy units. Could it be possible to make a friendly military unit in the vicinity of a surrendered enemy unit just start auto-capturing it within a set time? It would be a kind of a game-changer, but would really help after all those big battles when there are surrendered guys all over the place and you have to zoom in, click exactly the right spot, select your own units and so on. I like what antiscamp said. But perhaps it could be some sort of stance rather than something that happens automatically? Something that sets unit defensiveness down by 50% and limits sight range to simulate the soldiers being spread around and not in a battle formation but allows them to automatically capture all nearby units. Severe food shortages starting out. I was tempted to disband one or more legions--fewer mouths to feed, build workers. Once I reached the Rhenus, the bridge was already built by the Eburones, and I can't build there without breaking the ceasefire. No crashes so far--stability seems to be improving. Should an enemy army be able to oppose a bridgehead? I don't know about Roman times, but in more modern ones (American Civil War and later), forcing a bridgehead can be bloody. Right now, the army that wants to cross the river seems to have an advantage. Maybe the bridging unit should be spread out over the river (and more vulnerable to missile fire) when bridging. Maybe the unit breaking out of the bridge has a disadvantage (can bring few men to bear--enemy unit blocking egress has numerical advantage. Why can't I cross a neutral or allied bridge? Why can't I trace my supply line across a neutral or allied bridge? I would understand a higher supply line penalty when crossing a non-owned bridge. Should all factions be able to build bridges and forts? Shouldn't the Romans have some kind of advantage in building bridges and forts, and even supply lines in general (Roman roads)? I still love this game, the more so with each build--just have to ask why. Yes, there's a rather serious bug that that can interrupt the camera movement and cause the camera to be in the wrong place when the chapter starts - my understanding is that it's usually caused by alt-tabbing away during the cutscene. This is pretty high on our todo list and should hopefully be fixed soon. It's important that you can get within supply range of Bibracte before the enemy hits, but I think it might be interesting to trigger the enemies a little sooner so that there's less opportunity to prepare for players who already know what's coming. We might also forcefully prevent players from entering Bibracte until the battle is over because that does totally change the nature of the fight. The boundary and AI issues are ongoing problems we're working on. There are often multiple causes for these so improvements are likely to be incremental. I agree. I was hoping that since you can now queue up multiple commands in Rome that it might be a little easier, but I see that we could probably take it further. Frankly, now that slaves don't rebel, and there's little reason to just execute them, it might make sense to have some sort of auto-capture. There could be difficulties if there are multiple surviving factions present, but that might not actually come up. I'll keep it mind and look into the options. The food and bridge issues in chapter 3 are known. Eventually, you won't start with all of those legions, but will get most of them as rewards as you progress (this is the case with most of the chapters). We've also got the code in place to block the AI from building specific bridges, but haven't implemented that for chapter 3. Generally, we're working on adjusting the chapters in order so we're still mostly focused on chapter 1 right now. Should an enemy army be able to oppose a bridgehead? I agree, you shouldn't really be able to build a bridge until you've got the area secured. I don't know at the moment how best to implement that in gameplay (besides the fact that ranged fire could hamper construction), but I'll look into it. Why can't I cross a neutral or allied bridge? Why can't I trace my supply line across a neutral or allied bridge? It was in the original design, but we ran into supply and capture problems when it became possible for multiple factions to be using and occupying the same structure. In it's place we added the option to "Requisition" allied assets. This lets you "peacefully" take control of an allies bridge or city much as Caesar did in his campaign so that you can use it for yourself. I'll admit this isn't something that's explained very well at the moment and may get adjusted still as we go forward. For example, while it does provide a mechanism to cross allied bridges, it breaks the other's supply lines when you do it. It hasn't been activated yet, but we do have the mechanisms in place to put construction limits on what bridges/camps a faction or unit can construct. Specifically, the plan right now is to require an 'Advanced Bridge Construction' attribute to construct bridges ranked larger than 3 stars. By default, Caesar will have this ability and you'll be able to grant it to other units as a promotion. I'm glad you're enjoying it. This kind of feedback is exactly what we're looking for and why we're trying to get the community involved while we still have the opportunity to change some of these things. Thanks again for everyone's help. Chapter 2, after i defend the first city, there are more enemies come out of the fort. If i destroy that fort afterwards, i get a CTD. I can still capture or leave it be though. Chapter 1, after i defended the big city and told me to march right to another city. After i cross the river there is a dialog coming up. (Dont remember what it says exactly), i get a CTD as well. Battle of Bibracte: When dealing with reinforcements from the West, it's actually possible to get units stuck if the enemy doesn't move in far enough beyond the boundary. Now have 3 legions and Caesar stuck next to the red line unable to move away from it. Highly frustrating. Random thought: No mention of Crassus. Pompey is mentioned, Crassus is not. Is this because Caesar is speaking in past tense of events just before crossing the Rubicon? Obviously Crassus was just as instrumental as Pompey for getting Caesar his gubernatorial provinces and seems odd that he would be missing from that particular speech, even if he is already dead at the time it is being given. First Chapter: After beating the Helvetii, when the map opens up. So you go after the Suebi, wonderful. But, what is the point of the rest of the map? There is plenty of extra space opened up but no shortage of any resource. Will extra missions be added at a later date or is it just a case of take it if you want it? Right now seems a bit pointless. Now I'm playing Chapter 4. In the diplomacy, I can make a truce with Caesar when starting out as playing Labenius' Legion. The game then reports that hostility between Labenius' Detachment and Rome has increased by 1. This seems a bit illogical. When I complete the first objective as playing Labenius, the game opens the console (screenshot). Caesar won't speak and continue the story. The message refers to a missing sound file (OGG). Gah! I was looking forward to seeing Vercingetorix himself!